We have been to the hospital every day for the past two weeks. My father-in-law is fading and we are looking for an extended care facility to help him with his needs. Many details of preparing for the future and helping to unburden him of his generally unremembered possesions have landed in our lap. We went through a small model of this three years ago when my mother-in-law passed away. After Thanksgiving dinner my three children, husband and sister-in-law drove over to the hospital to visit my father-in-law. The biggest event of my day, other than undercooking the 22 lb. turkey, was our unexpected meeting with Virginia. The first time we saw Virginia, she was fixing her baby doll’s hair and using markers to color pictures. Because we have been to the hospital every day for the past two weeks we have seen various stages of Virginia’s experience there. We have noticed that she has no visitors. Usually her expression is vacant. Sometimes we hear her yelling at the nurses. We had just been in my father-in-laws hospital room, catching up on the day’s events, searching his eyes and words for clues on his physical and mental condition when we heard a commotion across the hall. Virginia was having one of her episodes of noncooperation. Each nurse who approached her was quickly pushed away by her violent words and attitude. Then Virginia looked across the hall and made eye contact with me. Huh oh. Well, I smiled and tried to be pleasant. I guess it worked because she smiled back and started walking into our room. Huh oh again. She introduced herself, apologized for the intrusion, and expressed that she was needing to come into our room to find her clothes which the “bad people” across the hall would not let her have. So what could I do? I invited her in. My conversation with Virginia drifted toward her life in Alaska, her pug dogs, and the tree pendant she was wearing. In the meantime the nursing staff was trying to lure her out of our room but she would not have it. She wanted to stay put and sat down in the room’s wheelchair. She mentioned how sweet the girls looked in their dresses, which she had commented on at a previous visit when we passed by her. She apparently notices pretty dresses. She wrapped her silver hair in a colorful scarf and expressed her creativity by tying up her hospital gown unconventionally. When I mentioned that her tree pendant was something I really admired because of the verse that says we can be like trees planted by living waters she said, “See, when I saw you I knew that.” We are all so connected. We chatted a bit more and she again apologized for coming in as she was trying to find all her clothes that people had hidden from her. It was then that Virginia’s countenance changed and turned into tears. Through her sorrow she expressed that she was not a bad person and she was so sorry. All our hearts went out to her. I tried to console her and reassure her she had a good heart and was loved by many people. At the same time I was concerned for her emotional outburst occurring in front of my father-in-law because he of his own struggles – a body that has him jailed to a hospital bed and mental weakening. Since his stroke 15 years ago, heart surgery 8 years ago, losing his wife 3 years ago, this once stoic man has changed into a person who experiences unhidden and unapologetic emotion. We are all so connected. Virginia calmed down, the awkwardness in the room slowly lifted, and eventually a nurse was able to get Virginia to move on. She apologized again for coming in and said she hoped to see us and the girls again when we came to visit. I hope we do see her again and maybe she will remember us. In her sweet mind she is adorable. In distortion she is fierce. We are connected. Tonight I noticed that Virginia’s dolly is tucked into her bed and the pictures she colored are hanging up in her wall. My 8-year-old daughter does the same thing. We are connected. As a homeschool family I can become concerned that during this time our “school” time is very light. But these real life experiences are heavy and weighty and what really matters. I’m so glad they were able to experience reaching out and showing care for people in distress. We don’t need to run away. We can sit in discomfort and thankfulness. 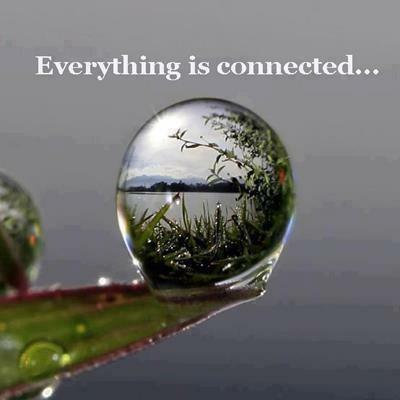 Be connected.